Brief Synopsis – When the sole copy of their debut movie mysteriously goes missing mere hours before its screening at Sundance, a filmmaking team must try to figure out what happened the previous night and locate to lost film. My Take on it – I was privledged to have the opportunity to be able to screen this debut feature length film directed by Hannah Rosner. 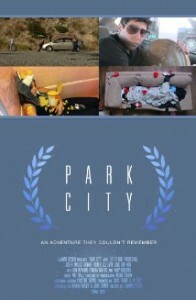 We all have heard about what kind of interesting things happen every year in Park City Utah during the Sundance Film Festival, but this movie gives us a satirical look at some of the events that go on around the actual screenings. The movie’s plot and jokes are mainly geared towards an audience of film makers but nevertheless those of us not in the industry can thoroughly enjoy the jokes and situations that the characters constantly find themselves in. Murphy’s Law is mentioned numerous times and that is truly the basis for this comedy where everything that can go wrong…does. I liked the use of the mockumentary interview to tell the story as opposed to the usual flashback scenes done in similar types of movies. The script and characters feel fresh and don’t feel generic. The dialogue generally is good, but there are a few scenes where it feels a bit forced. Overall this is pretty well done for a low budget film and I’m very interested to see what the director will be able to achieve when she gets a larger budget to work with. Bottom Line – Very enjoyable feature film debut of Rosner that shows she has a future in the industry. The script and characters are well written and most of the jokes work despite being mostly geared toward budding filmmakers. Recommended! MovieRob’s Favorite Trivia – Most of the film was shot on weekends, in and around LA while they edited it along the way. Er what?! Where can I find directors like this!!! !